UPDATE: 9/14 5 PM ET: Adding information regarding Netflix videos transcoded using AV1. YouTube has uploaded about a dozen videos that were transcoded using the AV1 codec, whcih was introduced earlier this year. The test sequences are expected to give Google as well as developers of browsers, decoders, and encoders an understanding how to better use the new royalty-free codec. Netflix is also testing AV1 codec and offers everyone a video in different resolutions and featuring various color depth. To date, YouTube has added 14 videos transcoded using the AV1 codec to a special playlist. The list includes various types of content, including a talking-head program, musical clips, action videos, and demo footages from RED and Blackmagic Design. YouTube says that this type of content represents a large share of videos hosted by the service, so it makes a lot of sense for the company to learn how they behave on various devices in terms of performance, power consumption, and overall stability. At present, AV1 support is available only in those Chrome 70 and Firefox Nightly builds released after September 12th. Meanwhile, the test videos use AV1 for resolutions that are lower than 480p, underscoring the fact that they are meant to test decoders that, for the moment, are going to be anything but optimized. This is on top of the fact that at the moment there are no hardware decoders that support AV1, so everything is being handled in software by the CPU to begin with. Eventually the codec will be used for content in 4K+ ultra-high-def resolutions, along with HDR and wide color gamuts. 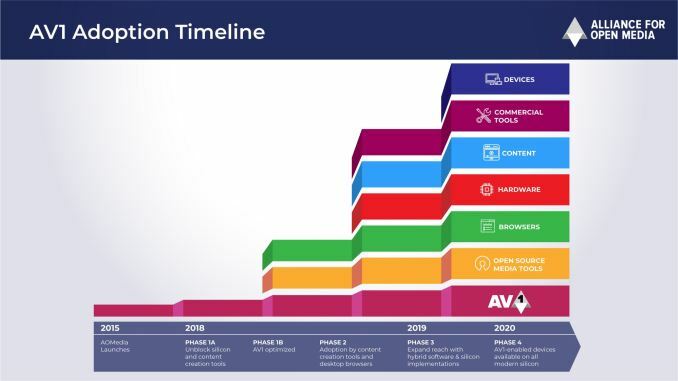 Finally, YouTube is promising to expand the collection of AV1-transcoded videos over time. AVI file is just a container that could hold video/audio encoded in many formats. AV1 is one such codec. Ugh. Yes, the file extension being the container type not the codec was a mistake IMO, since whenever I run into incompatibility issues with video files, it's due to missing a particular codec. You are right about the missing codecs problem (for which the expensive proprietary codecs like HEVC are to blame), however since containers such as mkv support just about any codec, things are kept much simpler and tidier. If each codec was container-less, each with its own extension, the situation would be quite messier due to the many more file extensions. To be fair it is compounded by the font if I type it here in the comments AVI and AV1 look reasonably different.